After lots of hard work and a crazy few weeks, our amazing Student & Parent Planners are finally here! I have been so excited to get these planners finished for you all! 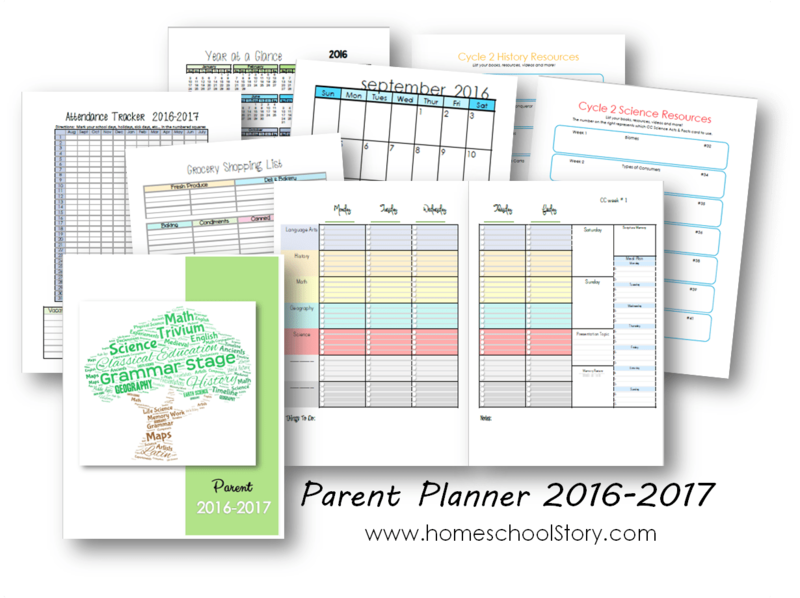 This time of year always gets us homeschool moms thinking about the NEXT school year, and we all love to be organized, right? Last year we sold almost 1000 planners to CC families just like you! This year we wanted to make them EVEN BETTER! Let’s talk Planners! 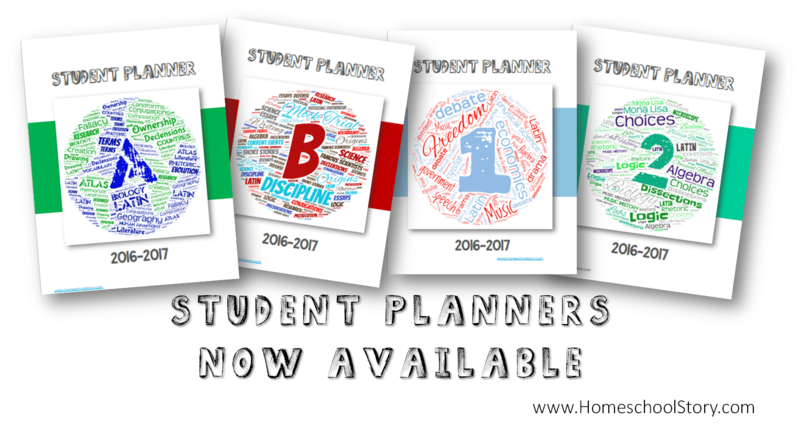 Our Student Planners have been made with CC students in mind. They have updated (and REALLY COOL – we think) covers! The covers each feature the main theme of the year along with word tags related to the content in each level. We also wanted to make sure that they were great for boys or girls so we got approval of some awesome CC Challenge kids to make sure! Level A Planner comes with Latin charts, geography maps, science paper outlines, chapter summaries and note-taking worksheets and more! 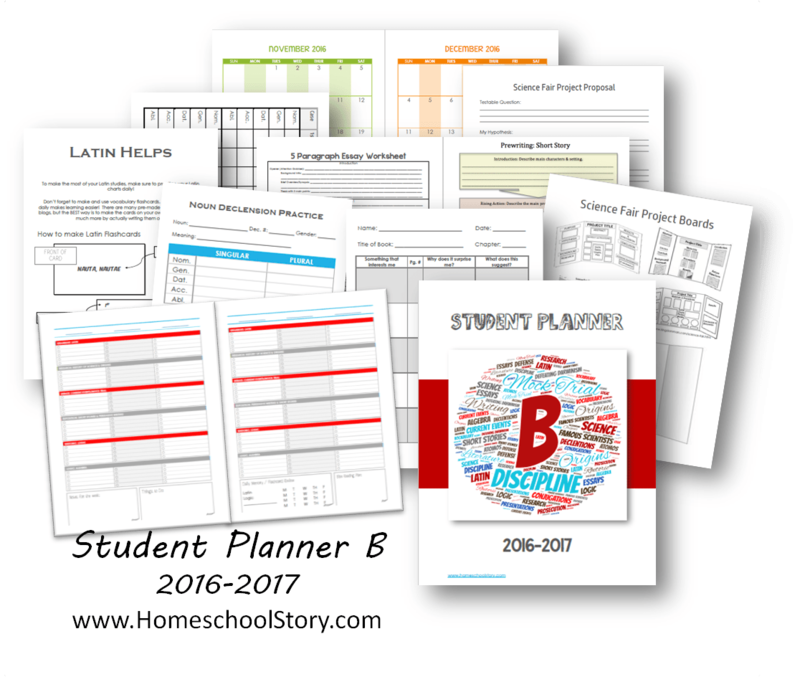 Level B Planner comes with Latin charts, science fair project proposal worksheet and board planning, essay outlines, and summaries and note-taking worksheets and more! 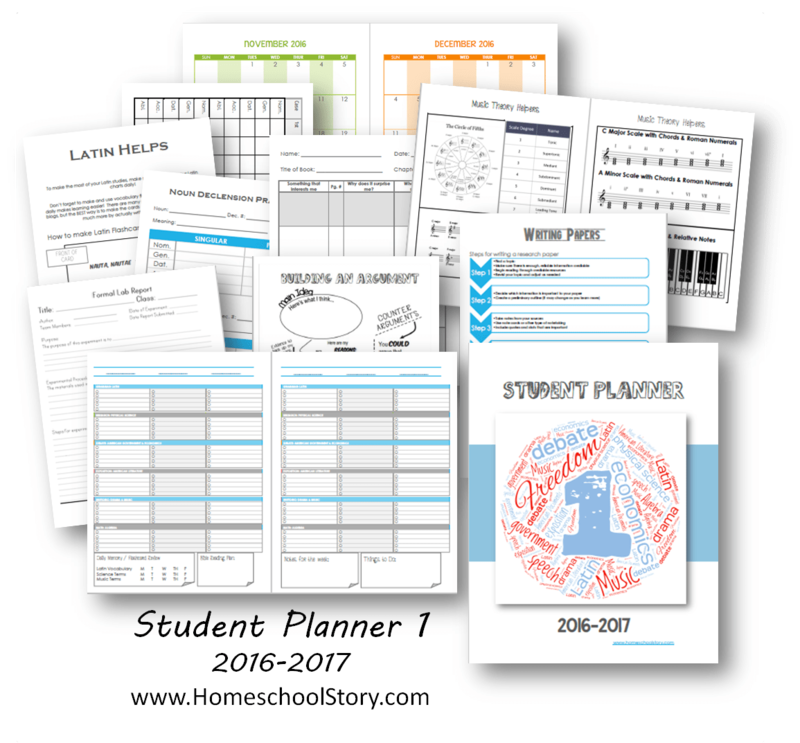 Level 1 Planner comes with Latin charts, science lab report forms, persuasive writing helps, science research paper outlines, music resources, chapter summaries and note-taking worksheets and more. 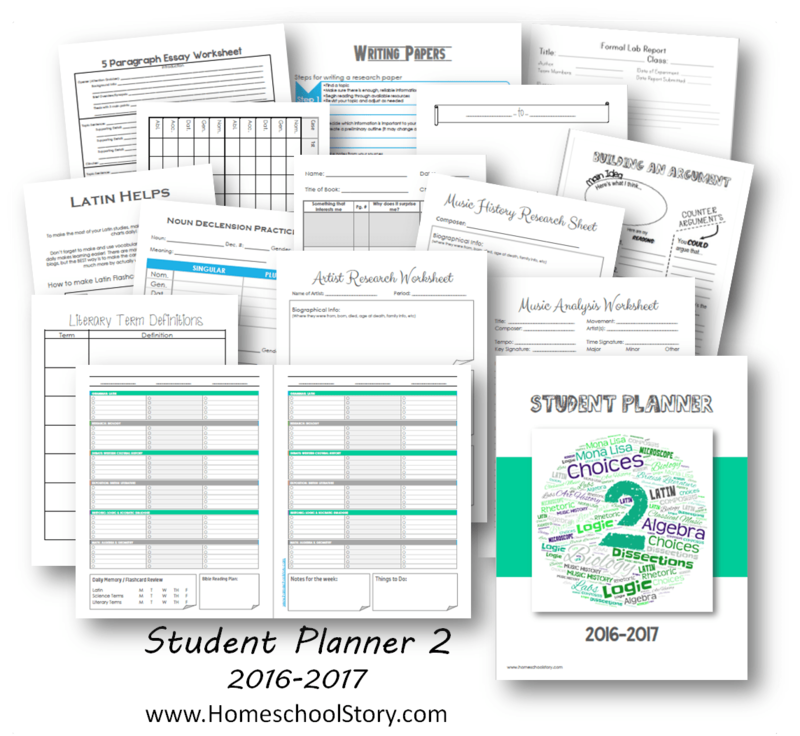 Level 2 Planner comes with Latin charts, essay outlines, science lab report worksheets, timeline template, persuasive essay outline, chapter summary sheets, note-taking resources, plus tons of worksheets and record-keeping sheets for Music and Art History! Okay, so I heard you when you asked me to make it easier to print double sided, so now all our planners come ready to print double-sided! You will notice some pages are blank…that’s to make sure that the correct pages print on the front (or back) as needed! Directions for how to print and which pages to print are included on the first page of your pdf download. 6 Day Week: I have removed the Days of the Week to allow for different campus CC community days. There are 6 columns for flexible planning. Daily Memory Review: Each planner comes with a Memory Review/Drill box with specific areas that should be drilled or review daily. These planners will normally sell for $15. As part of our Early Bird Special, this planner will be on sale for $10! Visit our Store to purchase this planner and also to see what other fun materials we have for sale! 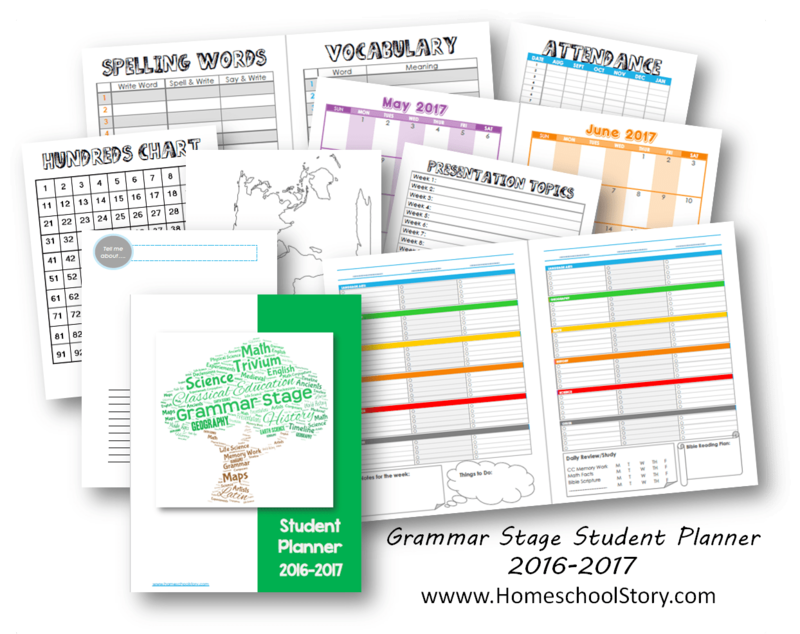 Don’t forget about our great Grammar Stage Student & Parent Planners too! These have been updated for 2016-2017 and are amazing! Just In: Help for Dads with Daughters! Is it possible to get the persuasive writing helps with the Ch A planner? I do have a persuasive writing worksheet in the Level 1 planner, but I can make it available to everyone! That’s a great idea. They definitely need it all the way through! Any plans on a Challenge III planner? I’ve had a few people ask about this. I do plan on creating an upper level planner that could be used by Challenge 3-4 or any Sr. High student! Hi: Are the Challenge III planners available yet? Is the early bird code still effective? Thanks. I went to order and it said the code has expired. Sorry for the late reply. Obviously the code is expired now. However, I will be doing a big sale in July again!! How many pages are in the Challenge A Planner? Hi Tonya, this year’s version of the Level A planner contains about 70 pages of calendar type pages. That would include the 2 page spread for each of the 30 weeks (60 pages), plus 10 months of monthly calendars (Aug-May – but there are additional months if you need them). There is also a cover page and resource pages. The resource pages can just be printed at home as you need them. You can print double sided if you want. I’ve always printed single sided and put them in my son’s binder divided up between 1-15 tabs for each week. Also I usually just print one semester at a time. The planners are in color, but they are also great in black and white if that helps with cost! I have a group of ladies who would like to order together. Can we use the coupon code and order together to get the extra 20% off? Thanks! Good morning, Love the look of your planners! I was considering purchasing foundations, essentials pack, challenge A and parent planner. Do you know when there might be a coupon code again? I hope you go in on the sale this last weekend! You can use the code 40off to sneak in an extra day today! Hello! I do not see an order under either of those email addresses. You might want to check your PayPal as well! Let me know if you need any further help. Hello I purchased 4 planners two nights ago. I have not received anything. I am wanting to confirm my order and try again, however I do not want my card to be charged twice. I bought several of your planners earlier this week and I can’t wait to use them this year. I do have a request. I just got our Challenge B Guide from our Director and noticed that the subjects are listed in the guide and in your planner in different orders. Is there any way you could update your file to put them in the same order? I ask because my son has some executive functioning deficits and having to skip around from the guide to your planner is going to be difficult. The order in the guide is Logic, Grammar, Research, Rhetoric, Exposition & Composition, Debate. Thanks for considering. thank you so much for your suggestion! I don’t actually have the Challenge B Guide, so I wasn’t sure what the order would be. I will see if I can’t change that and send out an update. Have you printed your planner yet? Thanks! I haven’t printed it yet, but will need to do it soon…We start in just a couple of weeks! This is the 2nd year we are using your planners but each discount code I tried to use states that it has expired. When will your next sale be? Thanks for your beautiful product! I would like to order your planner for Challenge A. Can you please confirm if you designed it after receiving the Challenge A guide so that things will coordinate well? I don’t want to order unless I know it will mesh with the new updated guide. The planners will work wonderfully with the new guides. They don’t actually contain anything from within the guides (copyrighted by CC) so any revisions won’t matter! I know many people who are already using them this year and there haven’t been any issues. Hope that helps. I really want to get this planner. Can you tell me if you designed it to coordinate with the Challenge A guide from 2016..this year? I am trying to decide between this one and one other and I want to confirm that info. before I order. Thanks. Hi!! Actually because there is nothing in my planners that specifically come from the CC Challenge Guides, any changes made to their guides won’t affect the planners. To add something that would be affected by changes would probably mean that it would contain copyrighted material, so I try to make sure that I’m not doing that. I bought the Challenge I and 2 planner, but I can’t seem to get these to load on Office Depot so I can print them using my CC discount. Have you had anyone else that has had this issue? I would like to type directly into my planners, I have Challenge 1 and 2; I am modifying one for Ch 3 also. Is there a way to do this? Hi! I am actually now working on that!! I might use you as my tester if you would be ok with that!! Are the planners available that allow for modifying? I am working on the spring semester this week. I purchased a Challenge A planner back in August, I believe. I love it~ It has been so handy and very helpful!! Thank you for making it. Will you have challenge a planners for school year 2017-18? YES!! They will be almost exactly the same with a couple changes. I took them down for a bit so I could add in the new 2017-2018 calendars! I’m also working on getting them to be editable like our newest planners! They should be up today so keep your eye out. You can check our store at http://www.homeschoolstory.contentshelf.com ! Is the CH2 planner still available? I se the cover in your store, but not the student planner specifically for CH2. 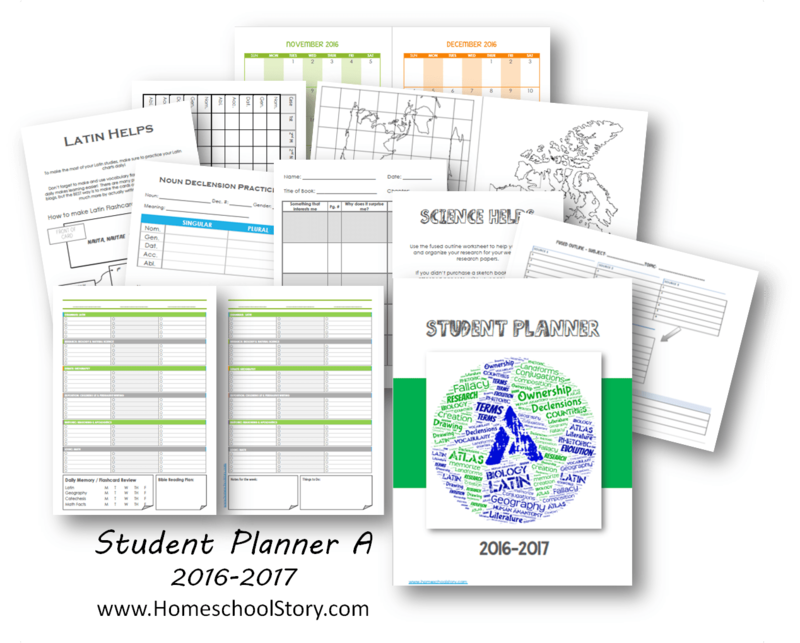 Hi Michelle, check out the blog post at http://www.homeschoolstory.com/student-planners/planners-for-cc-families to read about how our new and improved EDITABLE planners work. There’s even a video! 🙂 Bascially you choose the planner based on the day of the week that your community meets. This is because we now put the community day at the end of the week (since that’s how Challenge is built). Since they are editable, you buy once and edit them each year based on your child’s challenge class. So this year, you can type in all the Challenge 2 subjects and print it. You can customize it even more by editing the monthly calendars, adding specific items in each subject in the weekly calendar, etc. Next year there is no need to repurchase….just make the changes and reprint it! The covers are separate so you can just buy a new cover each year! I hope that helps. I’ve gone to the store, and I see the Challenge A cover, but I don’t see the Challenge A Bundle with the helps. What am I missing? That’s what I want! Hi Andrea! All the planners for Challenge are now editable! That means you just order a planner for the day of the week that your community meets, then edit the subjects to match the program your child is in! Next year, when you’re doing B, you won’t need to order another one! 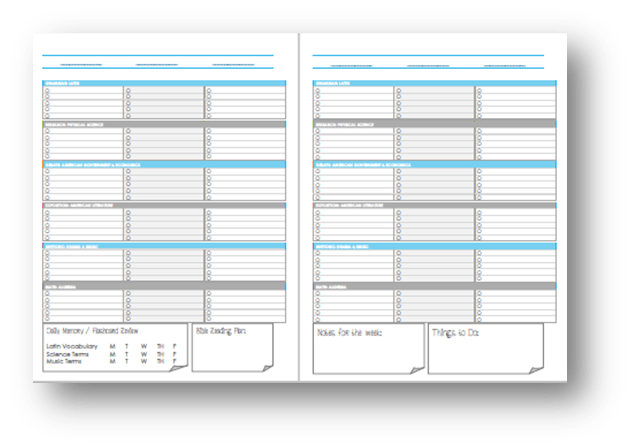 Just re-edit your planner and print it again! All the helps that were in the back of the bundles are now FREE! Just go to http://www.homeschoolstory.com/freebies and check them out!! To order a planner, go to the store, pick the day of the week you need, choose a cover, go ahead and get the FREE parent extension pack, and then check out! Make all the edits you need, add in any of the freebies, and print it out!! Hope that helps! My community day has changed. Any suggestions for me? We have used your planners for the last three years. Do I need to purchase a new one?